Focal Press has published Video Field Production and Editing, 8th Edition. 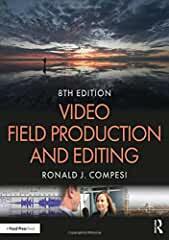 In the eighth, revised edition of this book, Ronald J. Compesi offers a comprehensive and in-depth introduction to the aesthetics of small-scale, single-camera video production in field environments, from planning through postproduction, in a range of different programming formats. Written in an accessible, student-friendly style, this new edition has been significantly updated and revised throughout to reflect current technology and industry practices, including shooting with DSLR cameras, in HD and on smartphones, new methods and channels of distribution, and much more. - An eResource with downloadable production planning documents, links to further online resources, production project exercises, and sample test questions. With over 40 years of teaching and production experience, Ronald J. Compesi offers an up-to-date and essential introduction to the art of small-scale video production in field environments in the new edition of this groundbreaking text, in print since 1985.